Space shuttle Discovery astronauts Alvin Drew, center, Nicole Stott and Steve Bowen add their mission patch as designed by the late, famed space artist Robert McCall to the International Space Station's wall. Space shuttle Discovery's final crew left its mark on the International Space Station Sunday prior to departing the orbiting laboratory today (March 7). Participating in a long-standing tradition established by previous visiting crews, the six Discovery astronauts added their mission's insignia to the station's wall and then signed their names around the decal. 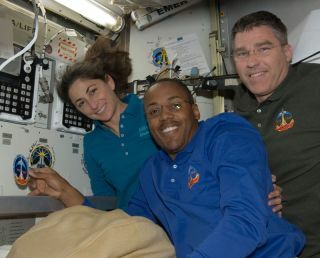 The simple act signified the successful conclusion of their goals while onboard the space station. "We delivered the last pressurized module, we delivered the ELC4 [cargo pallet], we did a whole bunch of transfer and we outfitted the [Permanent Multipurpose Module] as best we could," Discovery's STS-133 mission commander Steven Lindsey said during a farewell ceremony. The addition of the red, orange, and blue patch, which the crew also wore on their pressure suits, polo shirts, and on the pair of suits used for the flight's two spacewalks, also represented the final contribution by a famed space artist to the visual history of the United States' space program. Astronaut Alvin Drew volunteered to head up choosing the design for Discovery's final mission emblem soon after he was named to the crew in 2009. At the time, the flight was not only the last for Discovery, but was also scheduled as the final mission of the space shuttle program. "I saw it as something that might be fun to do," Drew said during a preflight interview with collectSPACE.com. It was not too long after, that he received a suggestion to call on artist Robert McCall. "I had gotten a suggestion from one of the workers at the Johnson Space Center. Bob McCall had done the [patch] for the last Apollo mission and the first shuttle mission. Wouldn't it be a nice bookend if he also got to do the last shuttle mission patch?" Drew recounted. In addition to designing the Apollo 17 and STS-1 patches, McCall was a highly-regarded space artist whose murals filled full walls at NASA's centers and the National Air and Space Museum in Washington, D.C.
"It was a great idea," recalled Drew. "If anyone was going to have any better design ideas than I have, it was going to be Bob McCall. He has all the experience at this." As much as he liked the idea, Drew didn't know if McCall was still designing patches or who to contact to ask if he was. Then a chance meeting introduced an opportunity. "I was in Star City [Russia] and one of the back-up space flight participants named Barbara Barrett, she was one of Bob McCall's neighbors and she was proudly showing us the personal patch that he designed for her." Drew asked Barrett to ask McCall if he'd like to design the patch for Discovery's last mission. The famed artist's reply was simply "Yes." Drew provided McCall with information about the flight and brief crew biographies. He also described what he wanted — and what he didn't want — from the design. "I [told McCall] I am not interested in any deep symbology or harking back to the ships or the shuttle program," Drew shared. "I understand it is the last one, but I just want a patch that is beautiful. A patch that really is just pleasing to the eye so even if we are not the last shuttle mission — because even at that point we knew we might not be — it would still be just a gorgeous patch to look at." Weeks went by and Drew hadn't heard from the artist, so he started to look elsewhere for ideas. "Lots of folks out there were submitting their designs and ideas for patches. A lot of them were really good." "Finally, I get this voicemail at work from Bob McCall. 'Oh yeah, I have been working on these patches,'" McCall told Drew. "'I was up all weekend,'" Drew recalled McCall saying. "He had found his muse and was just completely tickled with these patch concepts he had come up with." "I can't wait for you to see them!" McCall told Drew. The astronaut was excited by the artist's enthusiasm. "This is Bob McCall. He's been working on patch designs for as long as I have been alive and if he is kind of beside himself with these patch designs, I can't wait to see them either," remarked Drew. McCall told Drew that he'd FedEx him the patch designs "as soon as I figure out how to get these things digitized." "Look for them by Thursday or Friday," McCall said. Thursday and Friday came and went without a package. "Saturday, I see a newsgram that Bob McCall had passed away that Friday," recalled Drew. "So I'm like, well, I'm not going to see those patches. I am not going to bother his family." McCall, 90, died of a heart attack on Feb. 26, 2010. "I asked Barbara Barrett to pass along our condolences to his family," said Drew. Having given up on seeing McCall's designs, he resumed searching for patch ideas. Then, the following Tuesday, a FedEx envelope showed up in his inbox. "It had been held up by Johnson Space Center's security system," explained Drew. "So I'm sitting there, my hands just shaking because I just know what's in this thing." "This is the final works of art by Bob McCall." Continue reading at collectSPACE.com to learn how McCall’s last sketches became Discovery’s final mission patch.